Creating an attractive garden is all about contrasting textures, and that’s what makes this tiny wonder such a fabulous plant to have on your pallet. The gray-green leaves look like a succulent grass, and after the plant becomes established they can twist in the same swirling directions, like cowlicks. The plant only rises to about ten inches, and blooms a sort of mauve-pink in mid- to late summer, in umbrels, as is the alliums’ wont, atop one-foot stems. 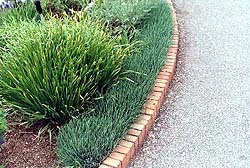 Allium senescens ‘Glaucum’ requires full sun and will disappoint in part shade. Soil need not be anything special – it’s an onion – but obviously good garden soil that has been amended with organic matter is best. The plant tolerates dry sites well. 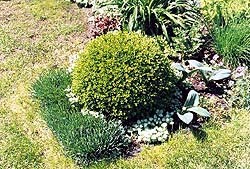 Use it as a groundcover and edger at the front of the bed. I took the top picture at the Minnesota Arboretum, where they use it a lot, and it does look great along a brick edge. But I’d never in my life plant it as shown, with a great, looming Siberian iris or whatever the hell that is providing zero contrast in foliage. Better to string it in front of perennial geranium, or combine with sedums, alchemilla, heuchera, campanula, anything with foliage that has lobes or some width and shape to it. You decide. The second photo shows ‘Glaucum’ in more formal mode, ringing a sculptured ball of Alpine Currant (it’s either that or Korean Boxwood, I don’t have my glasses on). Whether you grab it at an end-of-the-season sale or wait until next spring, buy at least seven. One here and one there won’t do much. It’s a cheap plant, maybe four bucks a pot in the Twin Cities. You want to create a narrow swath of the stuff, at a minimum two feet long, at maximum maybe a couple hundred bucks worth.